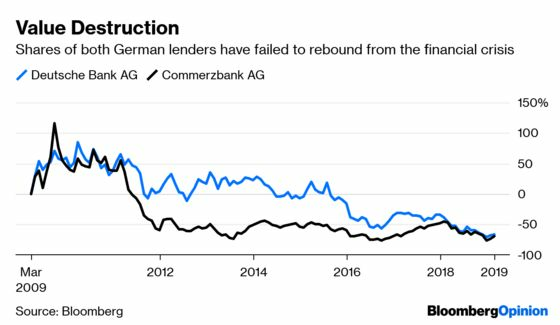 (Bloomberg Opinion) -- Deutsche Bank AG’s planned merger with Commerzbank AG is designed to create a national champion to oil the wheels of Europe’s biggest economy. 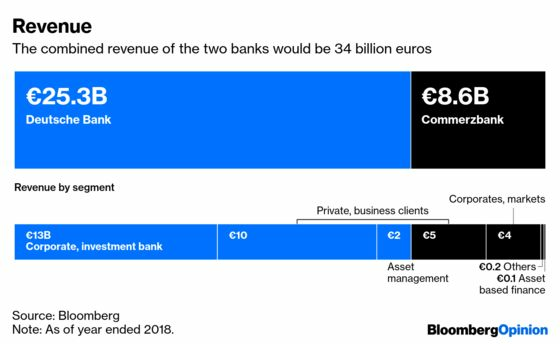 The combined business would have about 1.81 trillion euros ($2.05 trillion) of assets, making it Europe’s fourth-largest on that measure after HSBC Holdings Plc of the U.K. and French banks BNP Paribas SA and Credit Agricole Group. Here, in charts, is a look at what each bank brings to the deal. Together, the banks enjoy about 34 billion euros in annual revenue. While revenue from Deutsche Bank’s investment banking unit far surpasses that of its rival, one of the key attractions of Commerzbank is the lender’s income from German consumers and small and medium-sized businesses. Even after both banks have eliminated thousands of jobs, the two firms employ about 141,000 people combined. Reducing that headcount will be crucial if the merger is to pay off. That will likely mean pruning their branch networks, too. It’s not clear, however, whether a merger will stop the rot. Shares of both banks have tumbled in recent years, and the two trade at substantial discounts to the book value of their assets. Elaine He is Bloomberg Opinion's data visualization columnist in Europe, focusing on business and markets coverage. Before joining Bloomberg, she was a graphics editor at the Wall Street Journal and the New York Times.